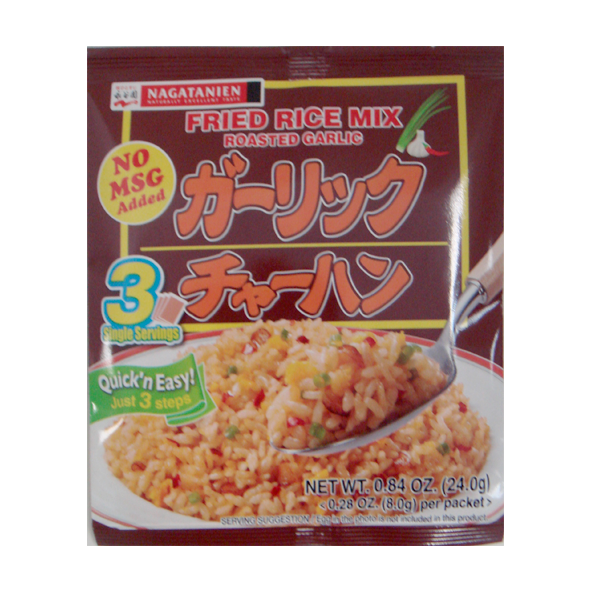 SOY SAUCE, SALT, GARLIC POWDER( GARLIC, PALM OIL),, SUGAR, DEXTRIN, YEAST EXTRACT, GARLIC FLAKE,ONION POWDER (ONION, CORN STARCH), RED PEPPER, WELSH ONION, MODIFIED STARCH, CARAMEL COLOR, SOY LECITHIN. Heat 1 tbsp of oil in a fry pan. Add 1 beaten egg and stir fry lightly with medium heat. Add 250g of cooked rice and continue to stir fry for 1 minute. Sprinkle with 1 packet of Fried Rice Mix, and stir fry 1.5 minutes.